Baltimore, MD (July 16, 2013) – We are pleased to announce that the voice actors featured in the dub of Wolf Children, Jād Saxton and Micah Solusod, will be attending Otakon 20. Jād Saxton has been acting and singing for Funimation Entertainment consistently for 6 years – singing is what actually landed her her first role in anime in Sasami: Magical Girls Club. After doing bits for Sasami and Hell Girl she landed her first major role as Masako Hara in Ghost Hunt. She then went on to voice Eve Genoard in Baccano!, Perrine-H. Clostermann in seasons 1 and 2 of Strike Witches, and Jacqueline O. Lantern Dupré in Soul Eater. Most recently announced releases include: Fairy Tail as Carla, Haganai as Sena Kashiwazaki, Michiko & Hatchin as Hatchin, Eureka Seven AO as Elena Peoples, High School DxD as Koneko Tōjō, Last Exile: Fam, The Silver Wing as Fam Fan Fan, Toriko as Yun, A Certain Scientific Railgun as Komoe, Steins;Gate as Faris Nyannyan, and Freezing as Arnett McMillan. Micah made his debut in the world of anime as the timid Malek Werner in Blassreiter, and was cast as the cool Soul Evans in Soul Eater shortly after. 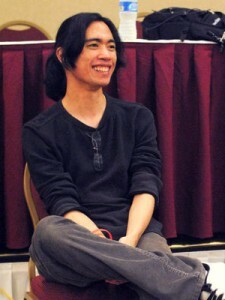 Since then, he has had the honor voicing a number of characters in other FUNimation titles such as Toma Kamijo in A Certain Magical Index, Tsutomu Senkawa in Birdy the Mighty: Decode, Yukitaka Tsuitsui in Level E, Kazuki Makabe in Fafner: Heaven and Earth Movie, Kamui and Subaru in Tsubasa Tokyo Revelations, Liszt Kiriki in Okami-San and Her Seven Companions, and many others. He can also be heard in Fullmetal Alchemist: Brotherhood, Darker Than Black II, Black Butler II, Deadman Wonderland, Shangri-La, Corpse Princess, Rideback, Sgt. Frog, Tales of Vesperia: The First Strike, Trigun: Badlands Rumble, Baka and Test, Shakugan no Shana, and Last Exile: Fam, the Silver Wing. In Wolf Children Jād voices Yuki and Micah voices Ame in their older forms. ABOUT OTAKON AND OTAKORP, INC.: Now entering its twentieth year, Otakon is an annual celebration of Japanese and East Asian popular culture, and also one of the largest gatherings of fans in the United States. Otakon celebrates popular culture as a gateway to deeper understanding of Asian culture, and has grown along with the enthusiasm for anime, manga, video games, and music from the Far East. Since 1999, Otakon has been held in Baltimore, Maryland; currently, Otakon is one of Baltimore’s few large, city-wide events, drawing over 32,000 people for three days each year (for a paid attendance of over 89,000 turnstile attendees). Otakon is a membership based convention sponsored by Otakorp, Inc., a Pennsylvania-based, 501(c)3 educational non-profit whose mission is to promote the appreciation of Asian culture, primarily through its media and entertainment. Otakorp, Inc. is directed by an all-volunteer, unpaid staff – we are run by fans, for fans.